A member has kindly written some interesting memories of living around Hob Moor in the 30s and 40s. You can read them here. We’re pleased to see the return of a kestrel to the moor after an absence of a few years. The AGM 2008 Minutes are now available. A link to a Google map of all the access points to Hob Moor is available here. On the Google map you can zoom and out, and see an aerial photo by clicking the ‘satellite’ button above it. Friends of Hob Moor commissioned a one-day exploratory dig by York-based On-Site Archaeology to look for the site of the watermill that used to be on Hob Moor. A 2m x 1m x 1m trench was dug by the Holly Bank entrance to Hob Moor at the corner of the Triangle. The mill is first mentioned in 1563 (see here) and although we didn’t find its location, amongst a lot of modern debris we found a number of pre-1800 roof tiles, indicating that there was a substantial late medieval building in the vicinity. The documentary records show that the watermill was the only pre-1800 building in that area, so we’re fairly confident that they will have come from the mill. In addition, at the bottom of the trench, they found an old watercourse, showing that the routes of the streams have been altered. Water management like this would again point to the nearby presence of the mill. We will be discussing the findings with York City Council’s Archaeologist. One of the two magnificent beech trees by the entrance from Holly Bank Road had to be felled. It was suffering from Meripilus giganteus, a fungal growth which rots the tree’s roots, making it unstable. The council acted very quickly and the 100ft tree was taken down on Thursday 9th. The Newsletter 2008 Sept – No 21 has been added. Last month, Mark Tyszka lead another fascinating walk around the moor, looking at the flowers and insect life. In particular, he was looking for buttercups. 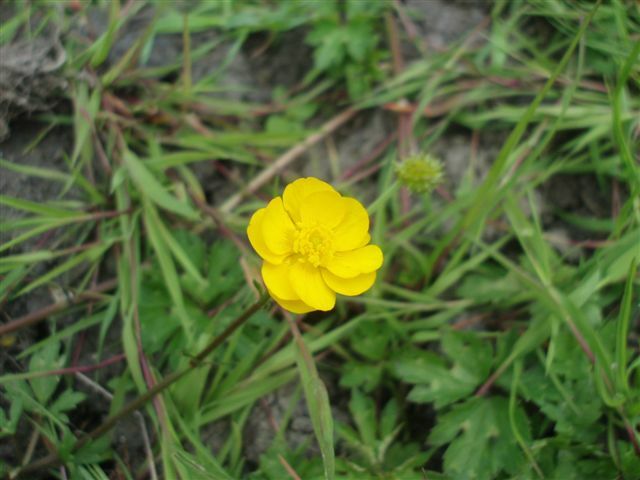 There is a new theory that the creeping buttercup plant, as it gets older, slowly mutates and that this mutation might be used eventually to determine how long the plant has been a particular site. One of these mutations affects the number of petals. The plants usually start with 5 petals and Mark managed to find a buttercup with as many as 11 petals. If the theory is correct, this could mean that the plant has been on the moor for possibly over 300 years. Our Newsletter 2008 May – No 20 is now available. The last day of the month was fortunately a beautiful sunny day as it was also the Hob Moor Local Nature Reserve Annual Gala. There were lots of atttractions including music, face-painting, charity stalls, a falconer and a fun dog show. It was also the first outing of our new gazebo, which is over twice the size of old one and has enabled us to double our display materials. We will also have a stand at the West Bank Park Gala on June 22nd. In order to reduce the impact on moor, a third of the cows will be taken off Hob Moor over the coming weeks, reducing the number to around 40. Some photos taken during the snowfall on April 1st have been posted here. A variety of summer events have been arranged, including a bird walk, a history walk, and a chance to look for bats! Do come along and join us. Click here for more information. A new section has been added for printable leaflets here. You can now download a 2 page introductory guide to Hob Moor. We plan to add more over time. After heavy rain last summer, the railway underpass flooded very badly, making it impassable. Since then, Friends of Hob Moor have been dealing with Network Rail and York City Council to try and determine responsibility and to take steps to prevent repeated flooding. As progress was very slow, we involved local Councillor James Alexander, who took the matter up on our behalf. At long last we are pleased to report that it has now been clarified that the tunnel structure is the responsibility of Network Rail and the underpass is the responsibility of the Council, who will be looking into providing improved drainage. The continued presence of the cattle on Hob Moor this winter due the Bluetongue outbreaks elsewhere in Britain has had a big impact on the moor. Areas that the cows frequent and where the farmer’s tractor has been are now very muddy and heavily rutted. 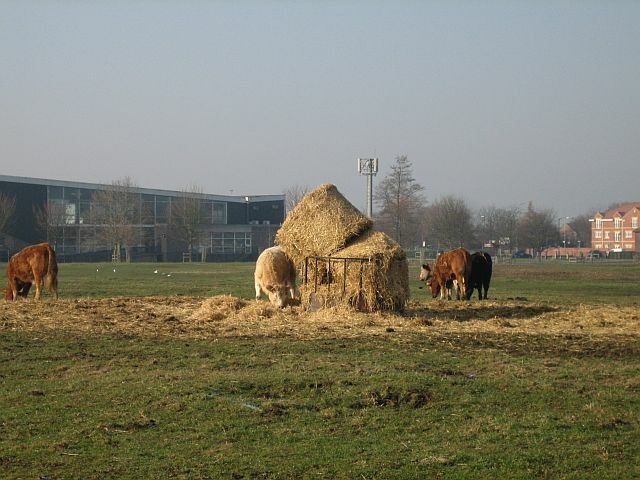 York City Council are doing what they can to try and get the cows removed as soon as possible. Once this has happened, they have plans for levelling and re-seeding the damaged areas, and there will be a two to three month period before cattle are allowed back to allow the grass to regrow. 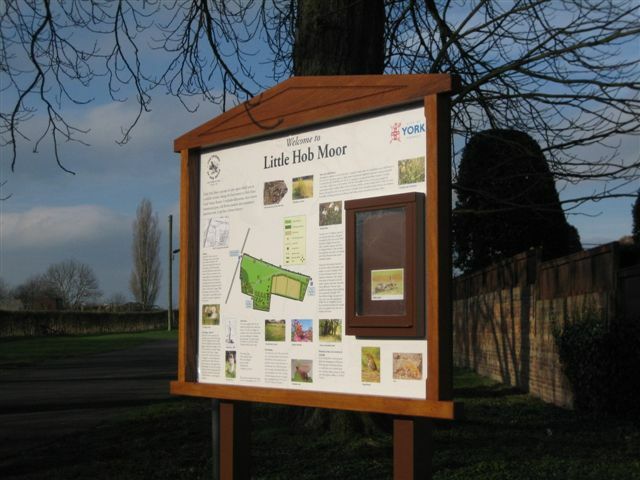 A new information board about Little Hob Moor has been erected next to the Tadcaster Road entrance, by the allotments. It was jointly funded by Friends of Hob Moor and the Council. Recent bird sightings include: a skylark singing on February 6th; a kingfisher; grey wagtails. As we reported at our AGM, we have been looking at ways in which we can make use of the profits from selling all 1,000 copies of our book on Hob Moor. 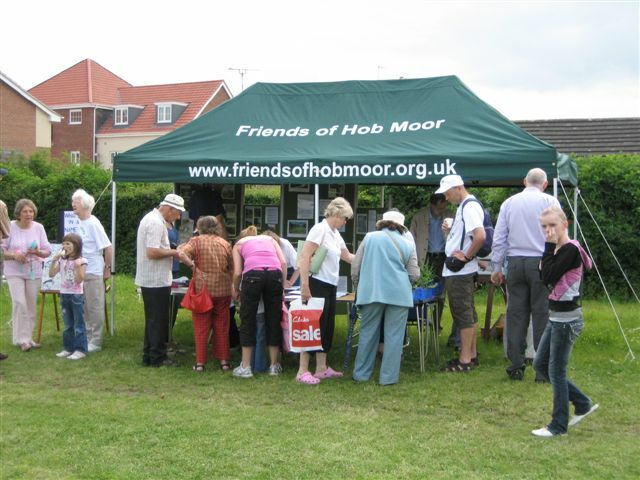 In addition to allocating some money to the website and buying a new gazebo for the summer events, we are sponsoring some exploratory archaeological investigations on the Triangle area of Hob Moor. We think this is where a water mill once stood and plague victims were housed in the 16th and 17th centuries. On Thursday 31st January a geophysical survey will be carried out, starting at about 9.00am, using two different types of magnetometer. Jon Kenny, the Community Archaeologist from York Archaeological Trust, will arrive about 1pm. At about 1.30pm there should be the opportunity to talk to Jon and those carrying out the survey, and to view the results so far. The Triangle is the small triangular section between the Holly Bank Road and railway access points (see the map on this page here). Access to the Triangle is from the Holly Bank Road snicket or beside the cattle grid next to the railway tunnel. If you are thinking of coming along, boots are recommended! Further investigations, eg trenches, will depend upon the results of the survey and external funding. We hope that this work will shed more light on the history of Hob Moor. A new section on ridge and furrow has been added here. The damp weather, along with the continuing presence of the cows and the tracks from the farmer’s vehicles when feeding them, has left the moor very muddy in places – see Winter link here. Whether related to the cows or not, there is currently a huge flock (or murmuration!) 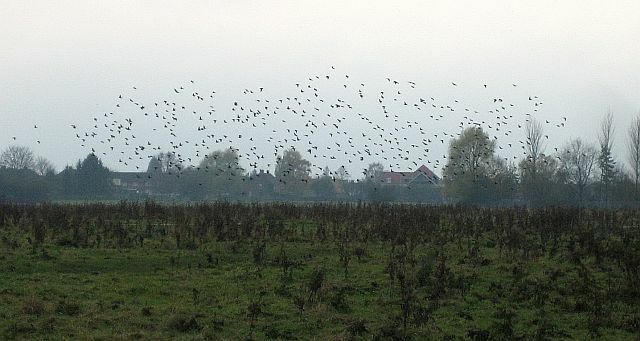 of starlings patrolling the moor on most days – at least 500 and possibly more.